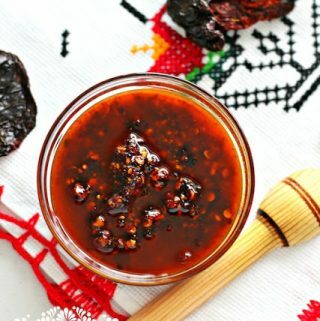 Salsa Macha is made out of dried peppers that are gently fried and then ground to form the sauce. Some versions use Arbol, Morita, or Serrano peppers, while others use a mixture of Morita and Chipotle. Variations include the addition of peanuts and garlic cloves. This salsa is very popular in the central part of the State of Veracruz, and for many years Morita peppers were only known in the States of Puebla and Veracruz, but nowadays you can even find them overseas sold by specialty stores or online. Morita peppers are a type of jalapeno pepper that has been dried and slightly smoked. In Veracruz and Puebla, they are also known as “Chipotle Mora”. 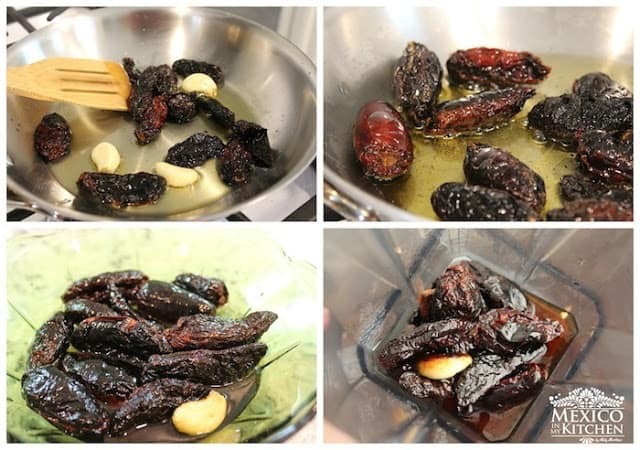 They are a dark and wrinkled peppers resembling the color of a prune, with spiciness similar to that of the Chipotle, but with a slightly sweet flavor. This is one of my favorites salsas, and it lasts for months in the fridge! 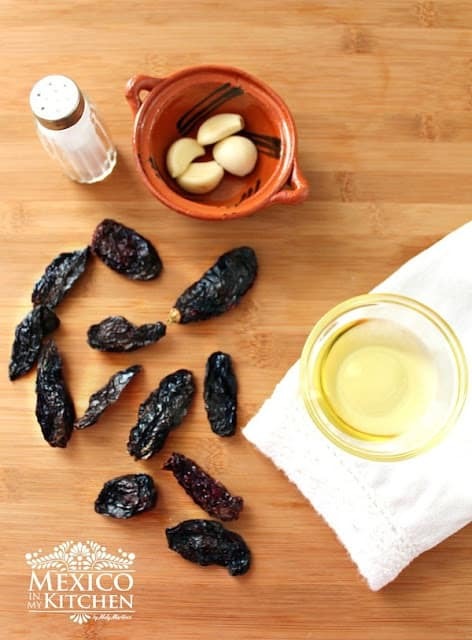 Remove peppers and garlic cloves, place in a bowl with the cup of hot water, and let them soak for about 8-10 minutes. Place in a blender with about ½ of the soaking water and the oil where the peppers and garlic were fried. Process until you have a rather grainy textured salsa. Season with salt and enjoy! Salsa Macha is made out of dried peppers that are gently fried and then ground to form the sauce. Some versions use Arbol, Morita, or Serrano peppers, while others use a mixture of Morita and Chipotle. Variations include the addition of peanuts and garlic cloves. Heat oil in a skillet over medium heat. Add the peppers and garlic cloves and fry. Peppers will inflate when ready. This step is quick, so make sure not to burn the peppers to avoid a bitter tasting salsa. Some cooks prefer to make this sauce using olive oil, and sometimes I use half vegetable oil and half olive oil. It lasts for months in the fridge, but you will definitely finish it before it goes bad. I like to enjoy it over fried eggs, meats, or even as a midday snack over a charred corn tortilla. Provecho! And if you make it, please come back to let me know if you like it. This looks wonderful! I will have to look for Morita peppers next time I am at the store. 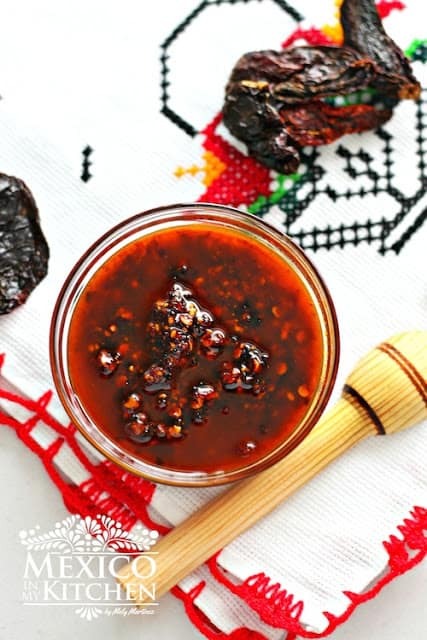 I usually make a salsa roja con chile de arbol, but it would be nice to try something new. Muchas gracias por visitar el blog y probar las recetas. La textura depende mucho del gusto de cada persona. 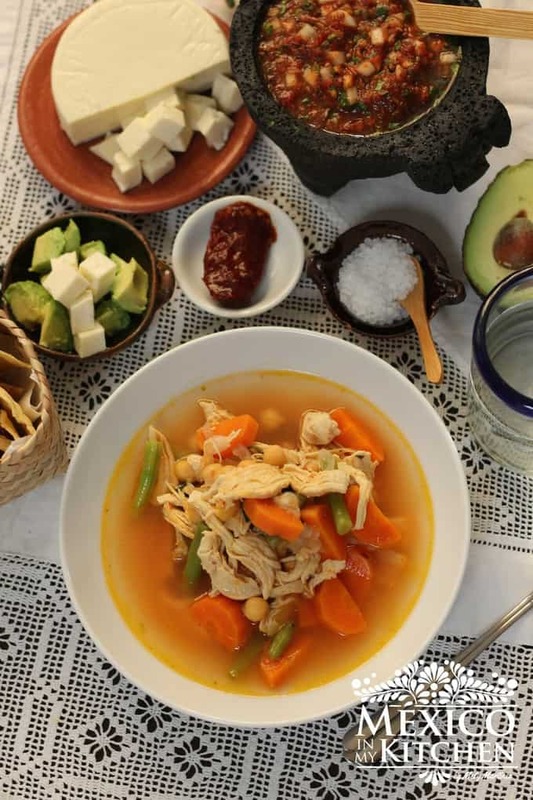 Usualmente se deja como martajada, pero si a ti te gusta bien molidita como quiera el sabor es el mismo. Feliz día en la cocina! How do I de-seed dried peppers without completely destroying the pepper? If you are having a hard time cutting the peppers to remove the seeds, it could be that your peppers are old and the skins are too hard that when you try to make a cut with scissors they break. If that is the case, place the peppers in your microwave for 15 minutes. This will soften the peppers skins making easy to make a slit and remove the seeds. If you want to avoid the use of the microwave, place them in a warm oven for about 1-2 minutes. Hola! I am curious as the level of HOT this sauce is on a level of 1 – 10 with 10 being the hottest. Thank you for posting your recipes. I’m looking through them now and look forward to making many of your dishes with the barbacoa being the first. Mi familia es de Zacatecas. Gracias por compartir tus recetas! Let’s say that it is about an 8. I tried to make this today, but I think I may have done something wrong. When I blended it up, instead of being kind of separated with the oil on top and the chilie bits on the bottom, it made more of a paste. One thing I did not do was remove the seeds. Could that have had an impact on the texture? The flavor is good, but it’s pretty spicy (that I know is from the seeds) and just way more “integrated” then your picture looks. It is usually made with the seeds included. The first time I made this salsa, I had the same results that you mentioned. The next time, I tried not to blend it for too long.